"Global Logistics and Supply Chain Consultants"
ExtraDigital have worked with Total Logistics over a number of years on both marketing and development projects so when their new marketing manager wanted to update the sites design to one developed in-house it was natural for them to approach ExtraDigital. Total logistics is a complete supply chain consultancy with offices in both the UK and Netherlands. They have a number of foreign language sites (Dutch, Russian & German) and undertake supply chain projects all over the world working with some very big household names. They had developed a new website design in-house and were keen to update all their websites to this new look and feel, but lacked the necessary in-house resources to do so and so approached ExtraDigital. Having worked with Total Logistics closely over a number of years we were aware that the new design would need to be able to effectively present different styles of information including interactive models, sector experience, case studies plus videos and whitepapers. As the site was being built in our content management system (ExtraCMS) we recommended creating a set of design templates. This allowed the web editors to select the most appropriate template for the website content while still keeping the design look and feel. 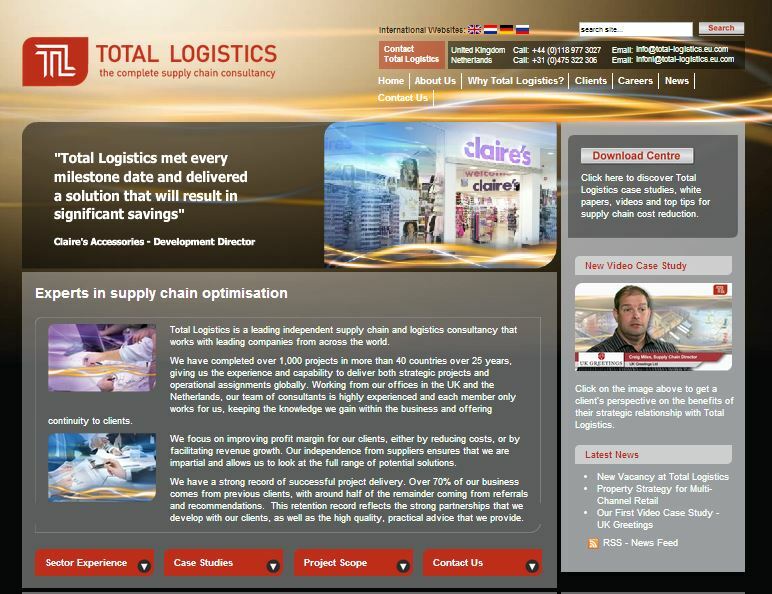 In addition we knew Total Logistics would need a website that fully supported their marketing including SEO, PPC, email newsletters and social media. We ensured the website build would fully support these elements both now and in the future. By taking Total Logistics needs and requirements into full account we created a complete brand identity online taking the initial design and moving it to the next level. Total Logistics were thrilled with the results and now have a clear and consistent identity across not only all their websites but also their social media and email marketing. There are a number of companies that use variations of the words Total and Logistics, but by having a clear brand identity visitors can clearly see that they have come to the right place no matter which marketing channel they use. In addition the way the design has been implemented has given Total Logistics the flexibility to develop their website and marketing without having to refresh the design or change their branding.